Take in the title in for a moment. Hulking rigid steel gravity coasters, which are know to give riders the willies for their steep climbs, fast drops, and extreme g-forces, are now being outfitted with virtual reality goggles...because coasters need to be scarier and more menacing than they already are. This was bound to happen. First up is Galactica, slated to open in April 2016, is a space-themed virtual reality experience that is grafted onto the existing "flying" Air coster at Alton Towers in the UK. If you don't know what a flying coaster is, the seats go from vertical to horizontal before leaving the station, simulating flying through the air like a drunk seagull. The video below features thematic music and visuals that looks like it came from Micheal Bay's b-roll from Armageddon. The good news is that this teaser gives very little away about the actual experience, which I'm sure most will appreciate and Alton Towers will take the bank. To further deepen the experience, future riders, or Galactinauts, can explore a thematic website to get pumped up prior to departing to the park. If you're old school and would simply prefer to ride the coaster without the VR experience, you can do that, too. Closer to home, Tatsu at Six Flags Magic Mountain in Valencia, California, is a similar flying coaster. Having ridden it several times myself, I can tell you that the pairing of an extreme coaster with massive dives and rolls with VR goggles will be very interesting to say the least. I can't wait to see where a VR roller coaster makes it debut in the US. Second up is from Universal in Osaka, Japan, featuring Japanese fashion model and singer Kyary Pamyu Pamyu. The coaster is called Kyary Pamyu Pamyu XR Ride. On a scale of 1 to 10, 10 being best, the name of this attractions gets a 1 on the originality scale. It's like calling Rock 'n' Roller Coaster at Disney's Hollywood Studios the Steven Tyler Tripp'n Ride. Like the Air coaster at Alton Towers, the virtual reality equipment is again added to the existing coaster Fantasy spinning coaster, which was a replacement for the E.T. dark ride. As the description implies, the cars spin along the track. Fortunately, the spinning capability will be disabled as part of the virtual reality upgrade in order to ensure precise synchronization between what the rider sees and feels. When the park announced the Kyary Pamyu Pamyu addition, it said it would be "like nothing that has ever been experienced before." Now revealed as Japan’s first VR coaster, the attraction will envelop riders in the artist’s music, fashion and unique music videos. The video is extremely confusing and somewhat disturbing, which is I'm sure totally appropriate for Japan. No word on whether the VR experience is optional. 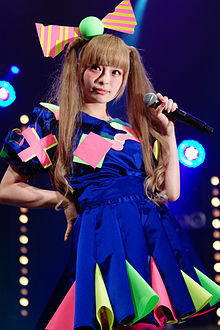 Personally, I know little about Kyary Pamyu Pamyu, but she looks like she popped right out of a Super Mario Bros. game. She's pretty popular and has even made it stateside and has plenty of songs and music videos to her credit. If this ride proves successful in Japan, we may just get our very own Kyary Pamyu Pamyu XR Ride at Universal in Hollywood or Orlando. I can't wait. The coaster is will premiere during Universal's Cool Japan video game, anime, manga and Japanese pop culture attraction, which runs from Jan 15 through Jun 26. Whether VR is the right application to increase the excitement on coasters is yet to be measured. Given the infancy of the medium, there is is plenty of time to see this evolve and we're not entirely unaccustomed to dark and scary rides. Take Disney's Space Mountain which is completely in the dark. In recent years, Disneyland in Anaheim, California, added an fun and intense soundtrack written by Michael Giacchino to heighten the experience of banking and diving in a completely darkened environment. This simple addition creates a much more exhilarating and thematic experience. If music alone can positively impact a coaster, I imagine VR may do just the same. I cannot ignore the fact that experiences through our own eyes is naturally in high definition. When you put on phone-base VR goggles, you are actually downgrading your vision. First the visual fidelity and depth of the virtual world is presently not on par with the vibrancy and depth experienced in reality, so things look a bit fake or more like a computer game. Second, there is, on occasion, some latency in how the image is presented to our eyes, both in visual fidelity and synchronization with real-world events. Our brains take the input and attempt to maintain equilibrium with the real world experience, and that sometimes creates motion sickness, eye strain and headaches. Furthermore, depending on the type of phone hardware in use, riders may actually see the small pixels that make up the image, which can create distraction and make it harder for people to fully enjoy the experience. Samsung Gear VR takes advantage of some of the most best screen technology and uses the Oculus Rift engine, so maybe these won't be that big of an issue. Then again, maybe the sheer velocity of the coaster will blur the riders vision enough not to care. Either way, I'm sure we're going to see an increase in YouTube videos showing people having fun...and difficulty. Regardless, I can't wait to give it a try myself.